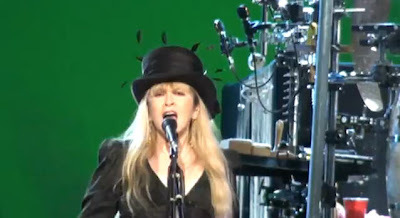 A couple of really great video captures of Stevie live in Sydney, Australia November 29, 2011. Stevie and the band sound and look awesome as usual! Stevie looks like she's sporting either a new Rock N Roll Top Hat or its a new feather attachment thing...Either way, looks great... The hat seems a little more stable on her head then the hats from previous tours with the long white feather. She dedicates this song to XFactor Australia's Reese Mastin. This was the only performance of the song on the Australian tour... So Sydney, you got a bonus! Also - "Edge of Seventeen" with Rhiannon & Leather and Lace links included. Always entertaining!!! :) <3 LOVE it!!! i was there @ this show - it was my 1st of 5. right from the beginning she said she was gonna do shorter song intros so they could fit in an extra song at the end. but she didint really cut them short - once she starts talking she cant help herself lol. also commented that there might have been a special some1 from the xfactor at the show. was great 2 hear this song live after seeing and hearing so many recordings of it. reece spent time with stevie after the show apparently 2 - have been reports in articles she wants 2 write with him etc but who knows....AND SHE GAVE HIM 1 OF HER GOLD CRESCENT MOONS. lucky lucky lucky boy!!!! man I'd kill For one of her GOLD CRESCENT MOONS! !